UKDN Waterflow > Advice > What is a P Trap Gully? 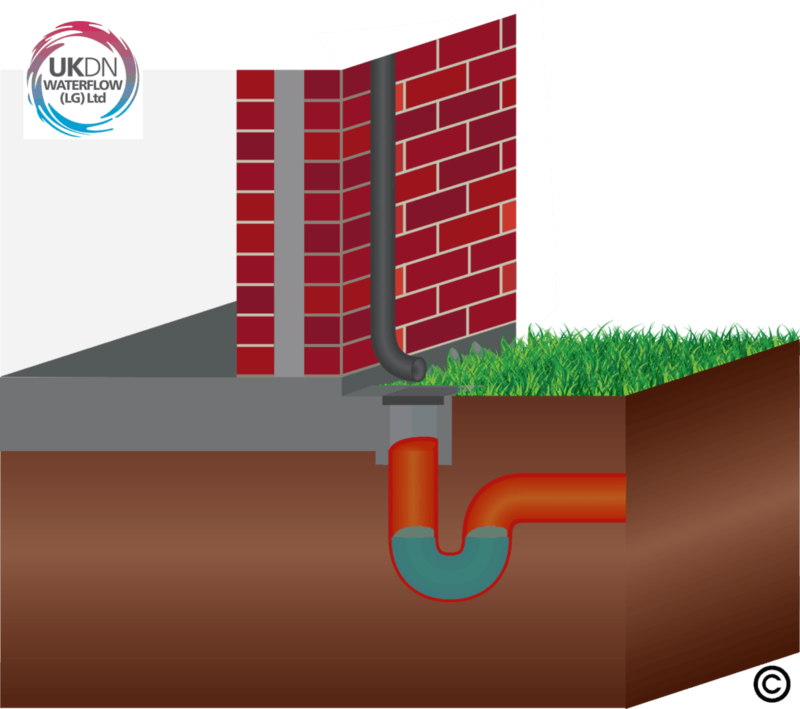 A gully trap allows surface water to enter an underground drainage system without smells and gases from foul drains escaping into the air around a building. In fact, its name describes its purpose. A gully is a drainage system designed to control surface water, usually from rain, and a gully trap is designed to ‘trap’ smalls and gases inside the drainage system. There are two main types of gully traps – the P trap gully and the bottle gully. They are used to collect water across all types of paved spaces, including block paving and asphalt. Most fitted in the UK are made from plastic. The P trap gully gets its name from its shape. Water runs into an opening called a gully hopper. This leads to a pipe that curves back upwards before joining the main underground drainage system. The curved section of the P trap gully – it looks a little like a P – creates a space that traps water in the pipe. This forms a barrier that prevents smells and gases from escaping from inside the underground pipe out into the atmosphere. There are two main types of P trap gully – the 45-degree P trap gully and the 90-degree P trap gully. Both work on the same principle. an illustration of a P Trap Gully, clearly demonstrating how the water reacts with the gullies. P trap gullies work very well, but they have one significant drawback. If they become blocked, for example by leaf mould, debris – or a child’s toy – they cannot be cleared by being rodded. Rodding is the simplest mechanical way to unblock drain pipes. A flexible rod is fed into the drain and pushed up against the blockage, breaking up the material or pushing it towards a manhole where it can be removed. Where P trap gullies are installed, the rods cannot get past the sharp bend in the pipe. Instead, with P trap gullies, a drainage specialist is likely to recommend using electro-mechanical pipe cleaning. This is a more flexible device, powered by electricity, with a rotating cutting head, that can be guided around the bend towards the gully blockage. The bottle trap gully is designed differently to the P trap gully. It does not trap water in a curved section. Instead, it makes use of an inner sleeve inside a structure that acts like a water bottle. Water drops into the centre of the bottle trap and is then forced up between the sleeve and the side the bottle trap to the outlet pipe, from where it can flow into the underground drainage system. With the bottle trap gully, water is still used as a barrier to prevent smells and gases from escaping from the underground drainage system. However, an advantage of the bottle trap gully design is that the inner sleeve can be easily removed to clean silt and debris that falls into the trap along with the water. Another advantage is there is much better access to the outlet pipe into the drainage system than with a P trap gully. 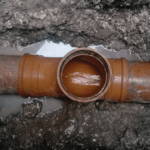 With the inner sleeve removed, a drainage rod can usually be inserted into the pipe to allow any blockages in the drain pipe close to the bottle trap gully to be dealt with. This may depend, however, on how deep the gully trap has to be set to work effectively with the wider drainage system. If necessary, where bottle trap gullies are installed, blockages can also be removed using water jetting. As with rodding, a drainage specialist can guide a hose through the pipe to dislodge material using high pressure water. A specific version of the bottle trap gully is the back inlet bottle trap gully. This can be installed at intervals in a relatively large drainage system to control rainwater across a large area. It has in inlet pipe to receive water from other parts of the drainage system. The back inlet bottle trap gully also takes surface water. Then both sources of water leave the trap via an outlet pipe set slightly lower than the inlet pipe. Both types of gully trap – the P trap gully and the bottle trap gully – have hoppers that receive the water from the paved area above. The hoppers may be joined to the gully traps with a length of pipe, depending on the depth that the traps have to be set. Gully trap hoppers include a mesh designed to stop debris from entering the drain, reducing the risk of blockages. The gully trap hoppers can be round, square or rectangular. The most popular shape for gully trap hoppers is square, because that allows them to most easily be incorporated with paving. Gully traps form a key part of a property’s drainage system. They ensure the proper and safe dispersal of surface water around properties, so are very important for flash flood prevention. If they become blocked, during periods of heavy rain, standing water can build up and could enter properties causing flood damage. It is essential, therefore, that both P trap gullies and bottle trap gullies are maintained properly. This may require having gully traps being inspected and cleaned regularly by the professional drainage specialist.